With St. Patrick’s Day a couple weeks away, I’ve been itching to make a rainbow-inspired project. 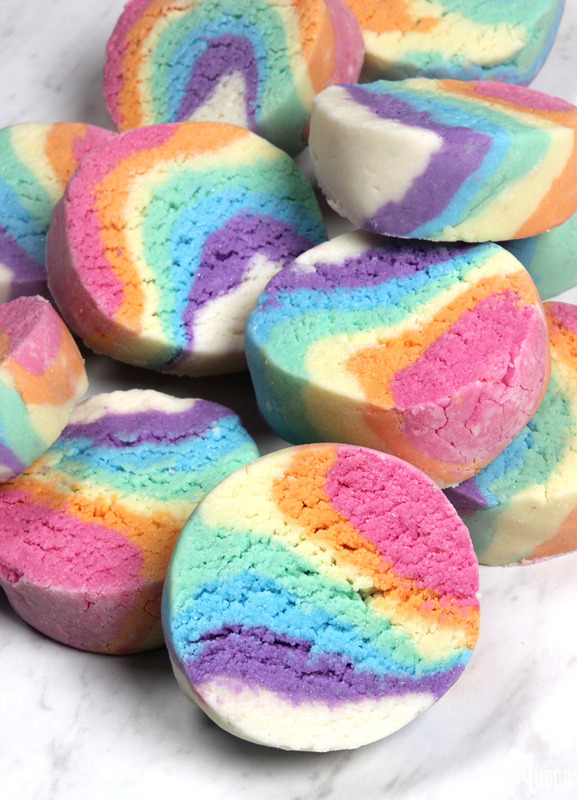 Thus, Rainbow Bubbling Bath Truffles were born. 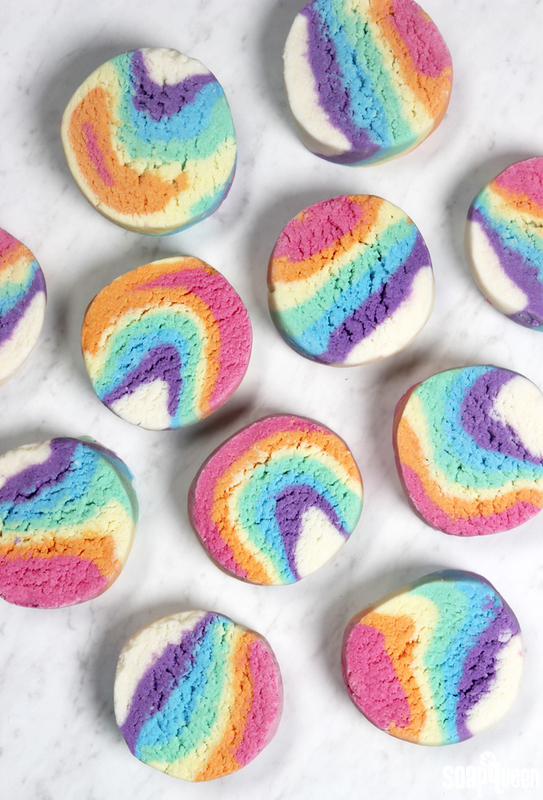 The bars aren’t quite a bath bomb, bath melt, or bubble bar – they are a little bit of everything! The combination of sodium bicarbonate (baking soda) and citric acid creates a mild fizzing reaction. The addition of SLSA creates bubbles, while cocoa butter cubes and shea butter add moisture to the tub. The new Fruity Fusion Fragrance Oil gives the bath truffles a fruity scent, which smells delicious combined from the chocolatey smell from the cocoa butter. They smell a lot like chocolate covered gummies – yum! When added to the tub, the bath truffles fall to the bottom because the butters make them quite heavy. Slowly, they start to fizz and disperse the skin-loving ingredients. If you want to activate the bubbles, hold the bar directly under the faucet once the tub is almost full. Break up small pieces of the bar in the running water. You can also place the bar into a fine mesh strainer and hold the strainer under the faucet to help activate the bubbles as well. The bubbles are modest because of the butter, but still cover the surface of the tub. 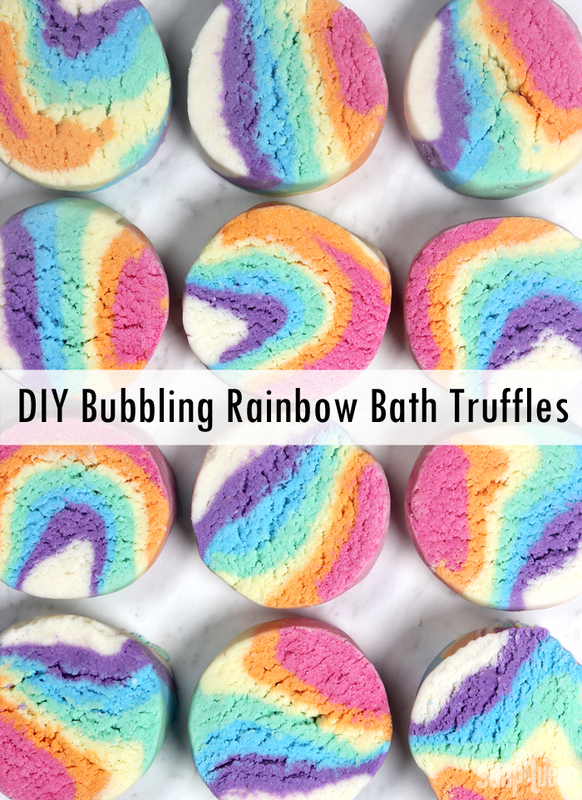 If you’re looking for more bubbles, less fizz and less moisture in the tub, a more traditional solid bubble bar recipe (like the LoveSpell Solid Bubble Bath DIY) may be a better fit. Typical solid bubble bath recipes can take a week or more to become firm. That’s because most of the moisture in solid bubble bath recipes comes from glycerin. One of the great things about this Bubbling Bath Truffle recipe is the bars harden within a few hours. The moisture in this recipe comes from shea and cocoa butter, rather than glycerin. Once the butters are completely cool, the bath truffles become firm. In our tests, this took about 3 hours. A small amount of glycerin makes the mixture slightly more moldable, and polysorbate 80 disperses the butters in the bath water. While these bars are extremely vibrant thanks to micas, we found the colors don’t transfer on the tub. Polysorbate 80 prevents the colors from clumping up in the bath water. All the colors in this project can be found in the Rainbow Mica Sampler Pack. You can also use La Bomb Colorants. Oxides and pigments are not recommended. They are larger than micas, which make them harder to mix in and could transfer color to the tub or your skin. 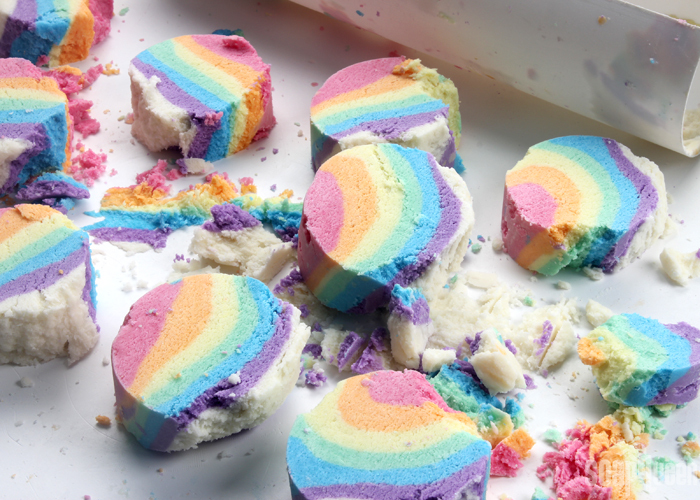 These bath truffles took several trial and error batches – four to be exact. The first batch was placed in the Heavy Duty Column Mold and allowed to harden in the mold for a few hours. The final bars were an even circular shape; little did we know it was beginner’s luck! The problem with that batch? It was so hard to get the log out of the mold. The mixture expanded, making the liner really difficult to slide out. The bars also didn’t create many bubbles in the tub. They looked great, but were difficult to make and didn’t behave like we wanted them to. After we tweaked the recipe to create more bubbles, we ran into the problem of the bars sticking to the liner. They were still hard to remove from the mold. You can see the sad third batch of bath truffles below. They stuck to the liner, and were also crumbly when cut. The crumbles still worked well in the tub though! When formulating a recipe, not every batch turns out perfectly! This recipe took four trials to find a recipe and method that worked well together. This batch stuck to the mold liner. After testing, we decided to ditch the Heavy Duty Column Mold. While it did give the first batch an even, round shape, it just wasn’t working. It was extremely difficult to unmold the bars. It was also hard to find the perfect amount of time to leave the bars in the mold. If they were removed too soon, they were soft and stuck to the mold. If you wait too long, it was harder to umold and they were crumbly to cut. The compromise shown in this tutorial is using the liner to help shape the bars. Then, they are cut immediately while still soft. If you want to substitute any ingredients in this recipe, it will change the texture of the dough. Changes to the recipe can affect how long you have to work with the dough, how firm the bars become, how easily the bars can be rolled and cut, how it behaves in the tub, etc. In general, I don’t recommend making substitutions for the dry and wet ingredients in this recipe. If you do want to tweak the recipe, consider making a smaller batch with one color to see how the changes affect the texture of the dough and results in the tub. UPDATE: Thanks to everybody who entered the giveaway! Two winners have been chosen, and the contest is now closed. Congrats to Heather and Victoria! 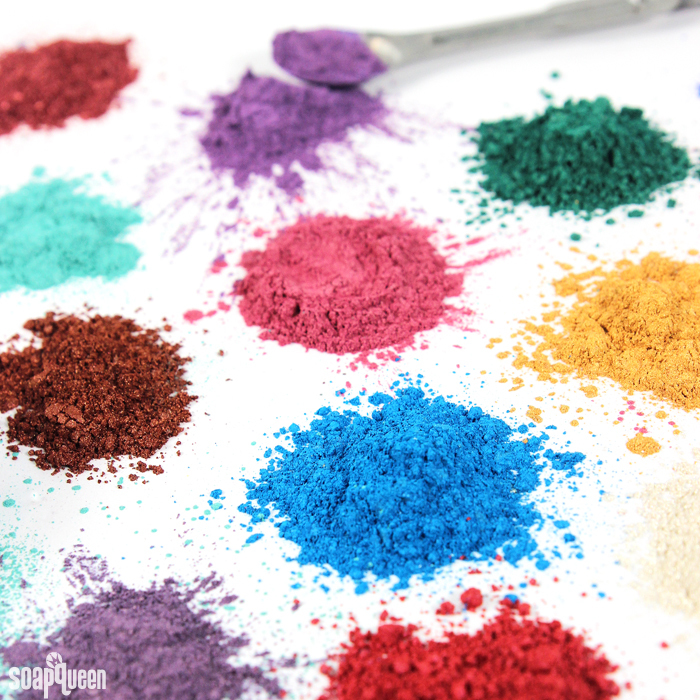 I’m so excited to introduce sixteen new micas and pigments! We spent months searching high and low for the best colors, and then tested them in a wide variety of projects. Micas tend to morph in cold process, so all the colorants went through multiple tests to ensure the color performed well. All of these colorants work great in both melt and pour and cold process soap, with minimal morphing. In particular, we were looking for more purple, green and blue shades. We also found several gorgeous orange hues and a stunning silver. 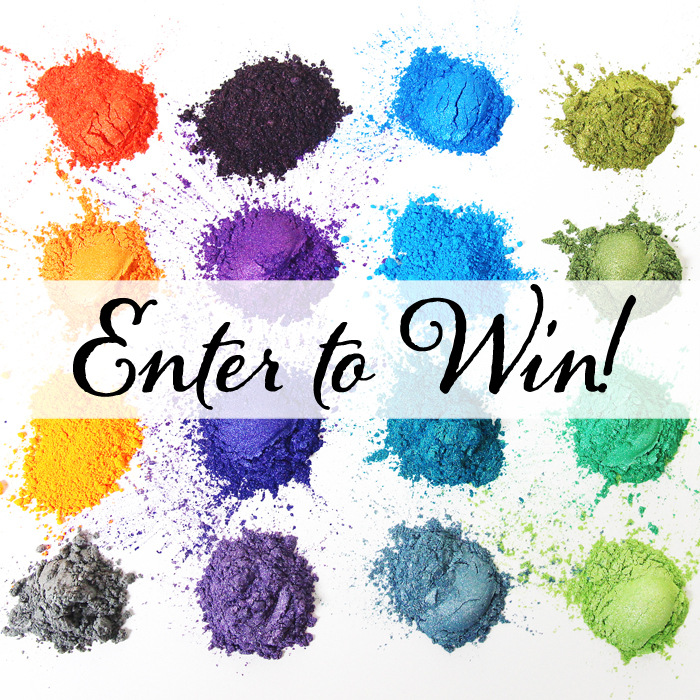 Check out the new colorants below, then learn how to enter to win a set of all sixteen colorants! (1.) Leave a comment on this blog post and let us know what your favorite Bramble Berry colorant is with a link to the colorant. (2.) Comment with a photo of a project made with a Bramble Berry colorant on this Bramble Berry Facebook status. Both winners will be chosen randomly. If commenting on Facebook, make sure to comment on this status. When choosing a random winner, this is where we will look! If you leave a comment on the Bramble Berry Facebook wall or through private message, you will not be entered into the contest. This contest is only available to residents in the 48 contiguous United States. The winner will be announced on the blog post on December 4th. The Facebook winner will be contacted via Facebook, and the blog comment winner will be contacted via the email submitted when leaving a comment. If there is no email associated with the comment, a new winner will be chosen. If the winner does not respond by the following Monday, December 7th a new winner will be chosen. That winner will then have 24 hours to respond, or a new winner will be chosen again. There are so many color options when it comes to soaping. You can choose a vibrant neon palette with plenty of pinks and oranges, or a more subtle and rustic palette with natural blue and gray tones. If you’re going for a vibrant palette, there are several tips and tricks to make your colors really pop. 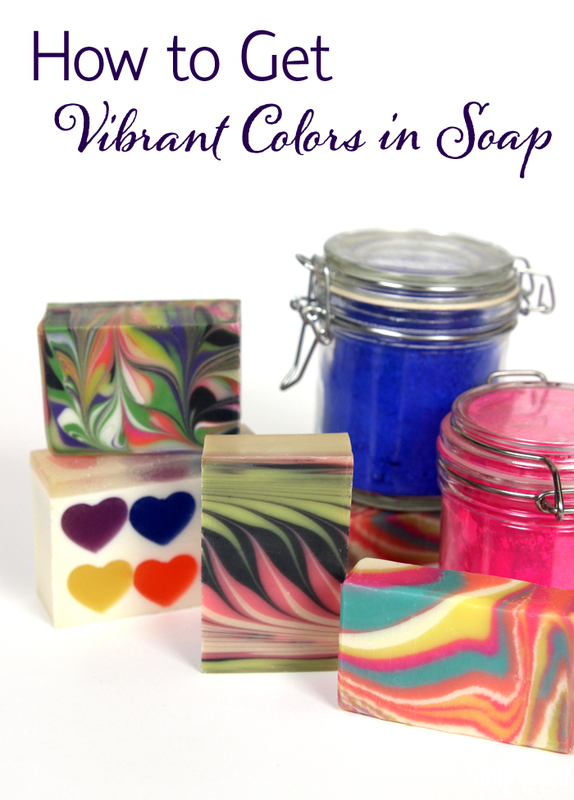 Bright colors can help your soap stand out and catch the eye of a potential customer. Not to mention you can impress loved ones with your excellent soapy skills and color selections =). 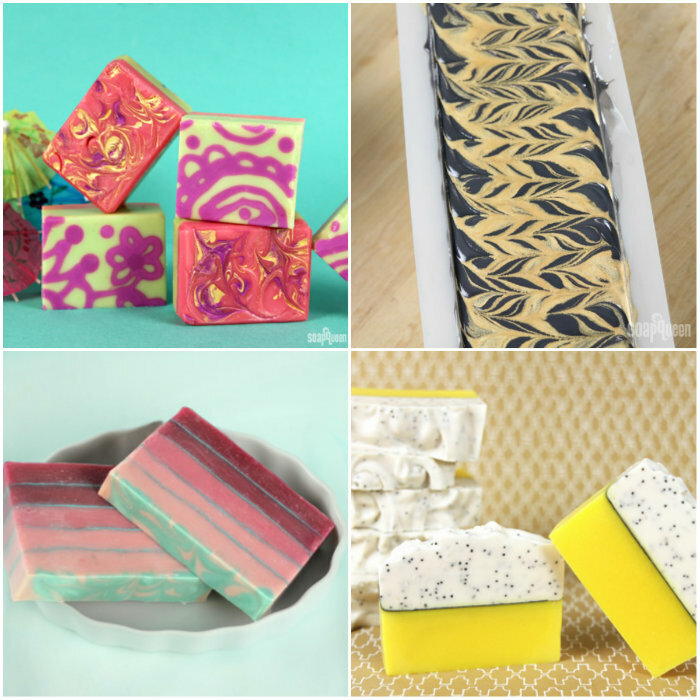 Let’s dive into the factors that affect the vibrancy of your soapy creations! What colorant you use plays a big role in how vibrant the soap will be. For instance, micas create gorgeous color in melt and pour soap, but some can morph or fade in cold process soap. Before choosing the colorant for your recipe, make sure to check how it performs. The descriptions on Bramble Berry have information on how the color performs, and some also have pictures of the colors in a finished bar of soap. 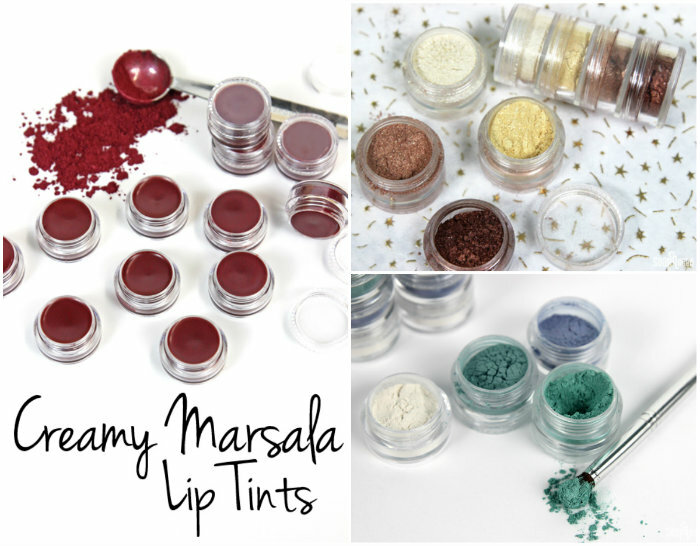 The Talk It Out Tuesday: Colorants post also has helpful information, including how to use each color in your recipe. 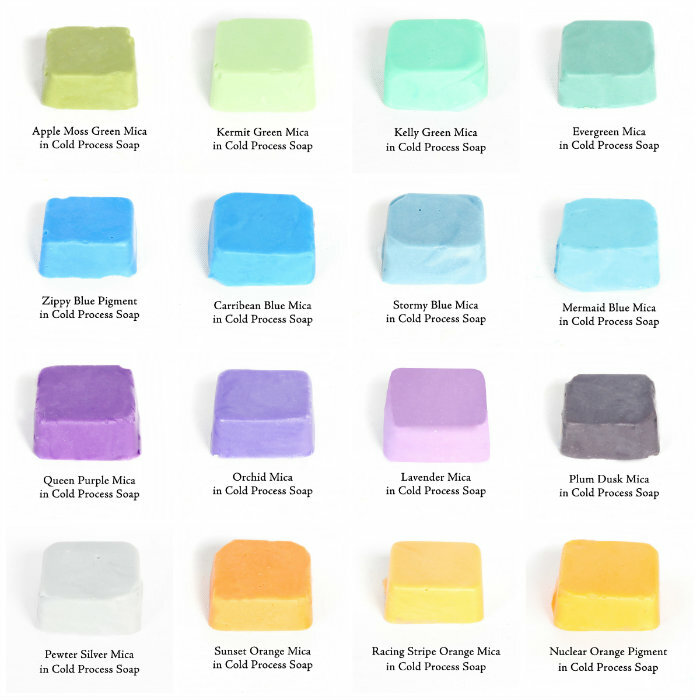 Mica colorants work great in melt and pour soap, but some can fade in cold process soap. 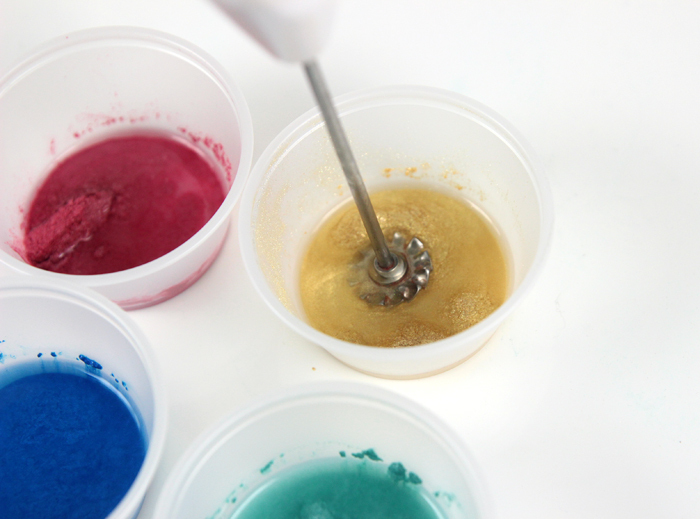 Micas: Mica colorants are a great option for melt and pour soap. They come in a variety of colors, and also add a beautiful shimmer to your projects. Check out the bright hues in the Romantic Rose Gold Melt and Pour Bars, which use several micas like Rose Gold and Super Pearly White. Before using micas in cold process, make sure to check to descriptions on Bramble Berry. They can fade or change colors in your recipe. The good news is micas that fade in cold process can be used as mica painting on top of it. They can also be used for mica lines, as seen in the Spiced Copper Cold Process Soap Tutorial. Learn more about micas in this Sunday Night Spotlight. 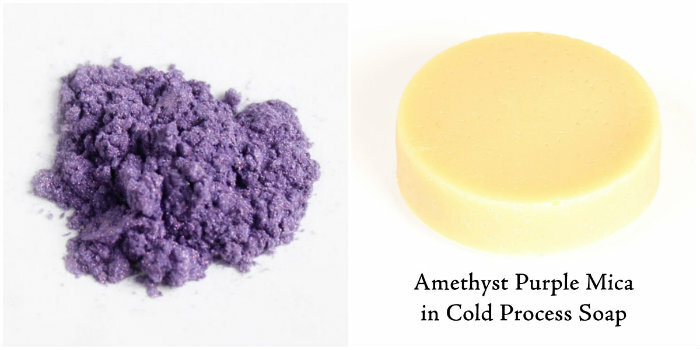 Pigments: Pigments are a great option for achieving brightly colored cold process soap. They stay true in the soap and there are plenty of colors to choose from. The Psychedelic Spin Swirl Cold Process Soap uses 5 different pigments to create a fun 60s vibe. Pigments can also be used for melt and pour soap, but some of the heavier ones (like Chrome Green Oxide Pigment) can clump or speckle the soap. To prevent that, you can mix the color with liquid glycerin or 99% isopropyl alcohol before adding it to the soap. You can also use color blocks. 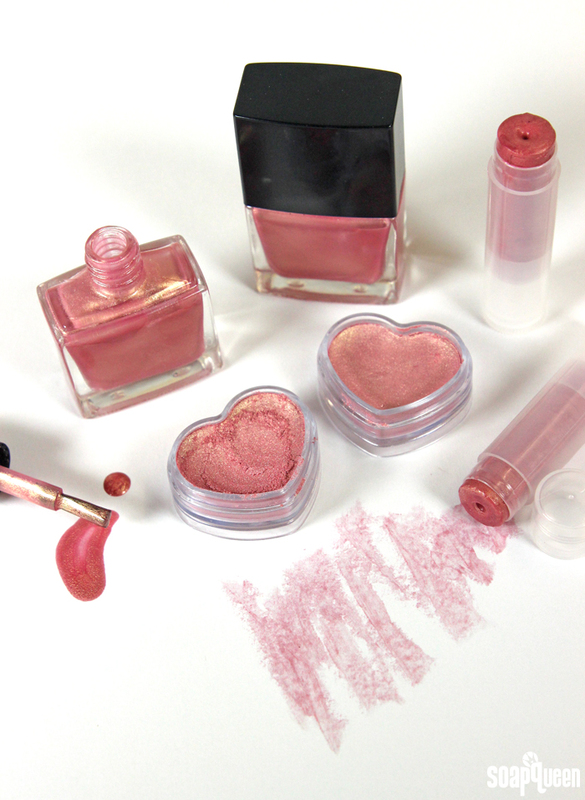 They are super concentrated pigments and micas that mix easily into melt and pour soap. LabColors: These liquid dyes are super concentrated and work for cold process and melt and pour soap. LabColors are another favorite option of mine when I want incredibly vibrant, bright hues. They do need to be diluted before use. Learn how to do that here. High pH LabColors are used for cold process soap. The Layered Lavender Cold Process Soap Tutorial gets its lovely hue from Periwinkle High pH LabColor. Melt and pour soap can be used with low and high pH colors. Check out the amazing amethyst color from Easter Purple High pH LabColor in the How to Make Soap Gems video on Soap Queen TV. LabColors do bleed, which is something to keep in mind when planning your design. Natural Colorants: Natural colorants, like clays and herbs, create lovely hues in melt and pour and cold process soap. 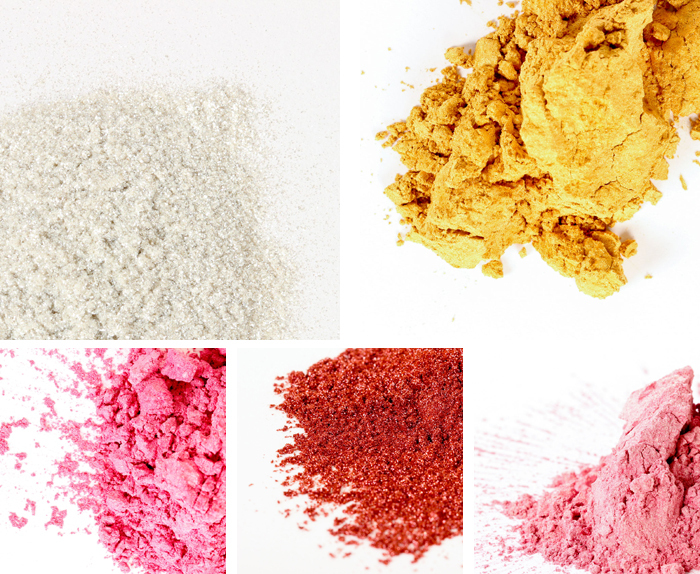 Natural colorants tend to be a little more subdued than other colorant options, but there are tricks to make natural colorants more bright. For instance, we recommend adding natural indigo powder to your lye water for a darker blue. Read more about using natural colorants in this Sunday Night Spotlight. You can combine the natural colorants with another colorant to create a more vibrant shade. In the Sea Clay Swirl Cold Process Tutorial, sea clay is mixed with Hydrated Chrome Green for a minty green shade. 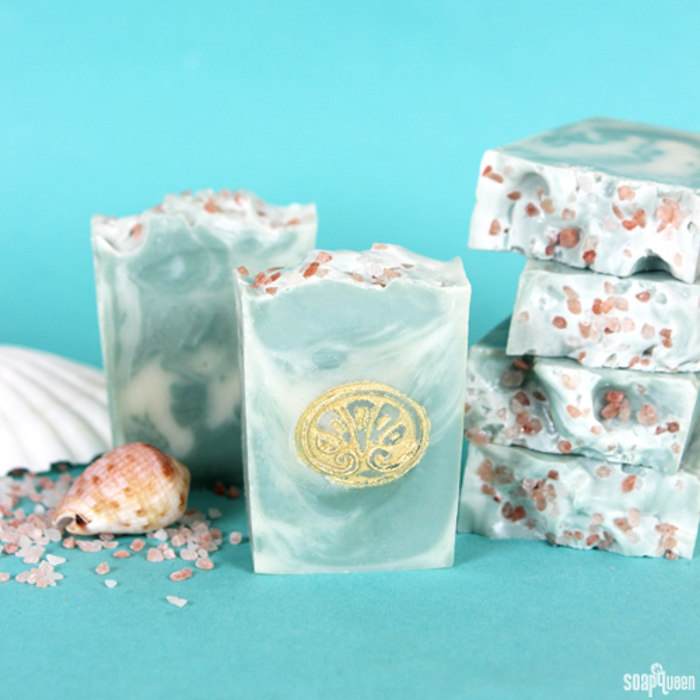 The Sea Clay Swirl Cold Process Soap uses a clay and a pigment to create the minty green shade. When buying new cosmetics, it can be tricky to pick out the right product. I know I’ve taken home shades of lipstick or eye shadow that look way different on than in the tube! That’s why making your own cosmetics is such a great option – you can create the perfect shades for your skin tone and preference. As an added bonus, you know every ingredient that goes into your recipes. Those who love easy recipes will love the Rose Gold Cosmetic Collection. It features a packed eye shadow, a lip shimmer made with moisturizing Nourish Lip Balm Base and a nail polish made with Suspending Nail Polish Base. The products all use Rose Gold Mica, which is a gorgeous two-toned color that looks great on a wide variety of skin tones. The color is also so on trend right now (there’s even a rose gold iPhone!) Best of all, making all three products only takes about an hour. The Rose Gold Cosmetic Collection makes 3 different products with just 1 ounce of colorant! In the world of beauty and cosmetics, highlighting and contouring has become amazingly popular (seriously, it is alllll over Pinterest & YouTube). This beauty technique involves applying darker and lighter shades of makeup to certain areas of the face to create definition. Applying darker shades is referred to as contouring, while applying lighter shades is highlighting. Contouring and highlighting can create the look of a stronger jawline and more pronounced cheekbones. It’s amazing how a little well-placed makeup can change the look of one’s face. 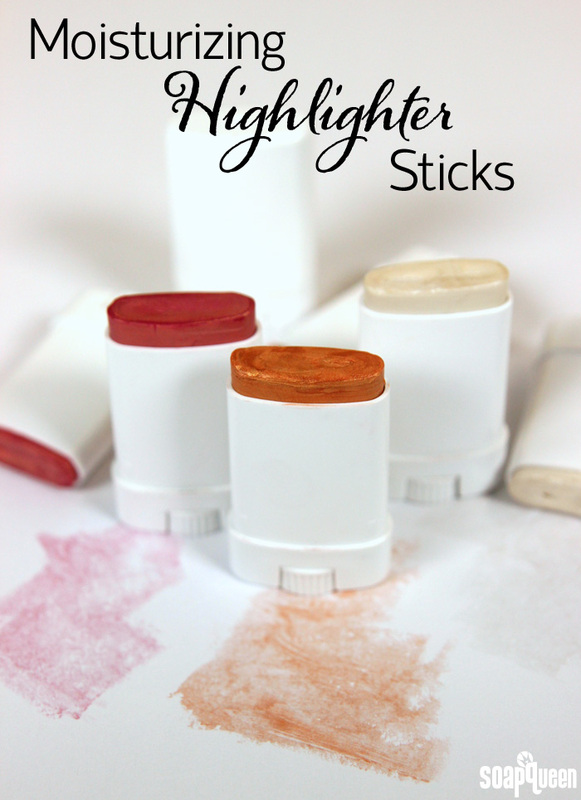 These Moisturizing Highlighter Sticks focus on the highlighting areas of the face that you’d like to “pull toward you.” Primarily, highlighters are used on the cheekbones and under the eye area. These highlighters are made with moisturizing ingredients such as green tea seed oil and jojoba oil to keep skin hydrated. Various colors of mica can be added depending on your skin tone. Below, we have formulated a basic highlighter shade with no color, as well as highlighters with a pink and peach tone. You can also add more or less mica, depending on how much highlight and sparkle you like. The amounts below could be considered an “average” amount. The spoon trick is perfect for testing them on your skin prior to pouring them into the containers. To see swatches on the skin, scroll to the very bottom of the post. Color is one way to give your bath and beauty projects personality and flair. But with so many colorant options, it can be hard to choose! One of the most popular type of colorant in soap and other bath and beauty products are micas. Micas are a powder colorant which usually contain a slight to intense shimmer. Extremely fine, micas are a great choice because they are easy to mix into a variety of mediums. But, micas can often morph in the high pH environment of cold process soap. In the soaping world, micas conjure images of rainbow-hued powders with lots of sparkle. In geology, mica refers to a group of metamorphic minerals. Metamorphic rocks and minerals are formed from pre-existing rocks by exposure to extreme heat and pressures. Micas come in many different forms due to the wide array of ways in which they can form within the earth. In fact, there are more than 20 different kinds of mica mineral! While all slightly different, mica minerals can be described as a shiny, flaky substance that can be peeled off into thin layers. Mica minerals come in a variety of naturally occurring colors. In addition to soap and cosmetics, mica minerals are used in a wide variety of applications including electronic equipment. Once the mica mineral is mined, it’s coated with FD&C colorants, pigments or a combination of both to achieve different colors. Are micas considered natural? It’s important to remember that the term “natural” is not regulated* and means something different to everybody (click here to read more about the term “natural”). The majority of Bramble Berry’s micas contain only mica and iron oxides, which both readily occur in nature and can be considered natural. If the mica is colored with FD&C colorants, the mica is not considered natural. 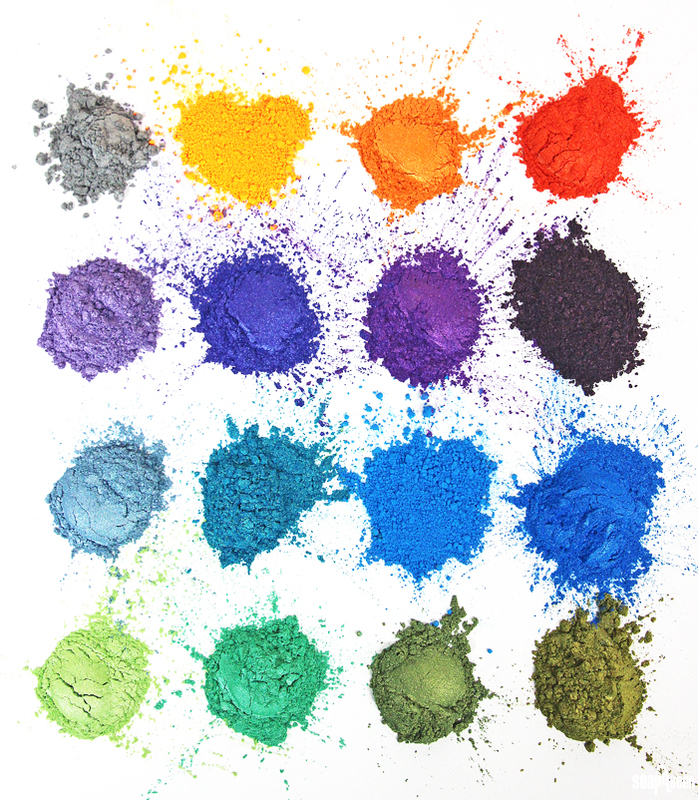 Below are a list of micas that are colored using FD&C colorants. You can find the ingredients of each Bramble Berry mica in the mica product pages. * 4/14/16 UPDATE: While there are still no guidelines or a legal definition that constitutes a “natural” product, the Federal Trade Commission (which enforces truth-in-advertising laws) charged five companies for falsely promoting their products as being “all natural” or “100% natural” when the product contained synthetic ingredients. Read more about the charges here. 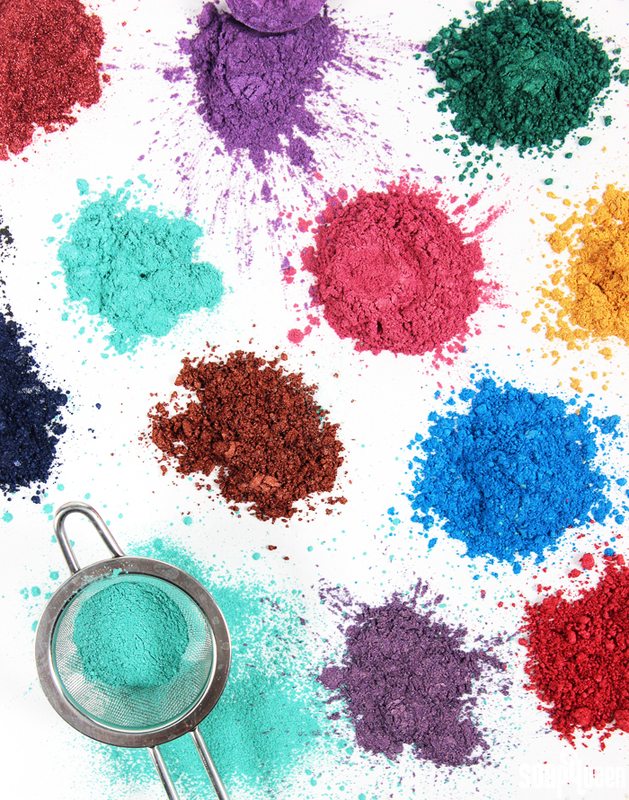 Mica colorants can be used in a wide variety of projects. Unfortunately, most micas morph in cold process soap. For example, Amethyst Purple Mica looks beautiful in melt and pour, but nearly disappears in cold process. Just check out the photo below! Typically, whether or not a mica works in cold process depends on what type of colorant is used to dye the mica. We recommend doing a small test batch to make sure the color is stable in your particular recipe. Morphing is not always a bad thing. Sometimes a mica can morph into a shade that’s still beautiful! For example, Coral Mica results in a soft peach color in cold process, while Cellini Blue Mica turns into a lovely lavender tone. Even if a mica does work in cold process, it often isn’t very sparkly. That’s because there is no light for reflection (since cold process soap is opaque). To use it in cold process soap, start with 2 teaspoon of colorant per pound of soap, and feel free to add more if you want a brighter color. Because micas are fine and easier to incorporate than oxides, dispersing the colorant in oil is optional. If a mica morphs in cold process, don’t fret! You can still incorporate them into your cold process projects with mica lines and mica painting. In the Lemon Poppy Seed Cold Process, Luster Black Mica is used to create a thin line between layers of white and yellow soap. The mica line (also known as mica vein) technique can also be seen in the Striped Berry Champagne Cold Process Tutorial. Mica painting involves mixing the colorant with a liquid oil, which is then applied to the top of the soap and swirled. In the Black, White and Gold All Over Cold Process tutorial, Gold Sparkle Mica creates stunning contrast against black soap. Looking for a brighter color palette? Gold Sparkle Mica painting also looks glamorous against hot pink soap in the Vibrant Mehndi Cold Process tutorial. Micas work great in melt and pour soap, with no possibility of morphing. If you are using a clear, transparent or translucent base, we recommend about 1/2 a teaspoon per pound to achieve a nice, strong pearl effect. Simply add the powder into your melted melt and pour soap base. If pesky little “mica bubbles” float to the top, spritz them with a bit of 99% isopropyl alcohol and you’ll see them burst open. Just stir everything in until the mica is well incorporated. For even easier mixing, disperse the mica into a small amount of rubbing alcohol with a ratio of 1 tsp. mica into 1 Tbs. alcohol and add to the melted soap base. You can also use micas in the form of color blocks! Click here to learn how to add color blocks into melt and pour soap. Dispersing micas into alcohol before adding them to melt and pour soap makes them easier to mix in. With a fine texture and lots of shimmer, micas are the perfect choice for eye shadows and lip products. While all Bramble Berry micas are skin safe, rules regarding eye and lip safe colorants are more stringent. 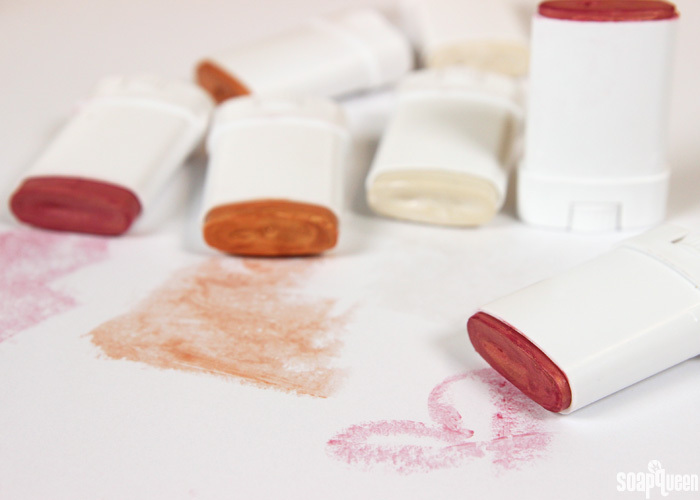 Click here to see a list of lip safe micas and colorants, and click here to see a list of eye safe micas and colorants. 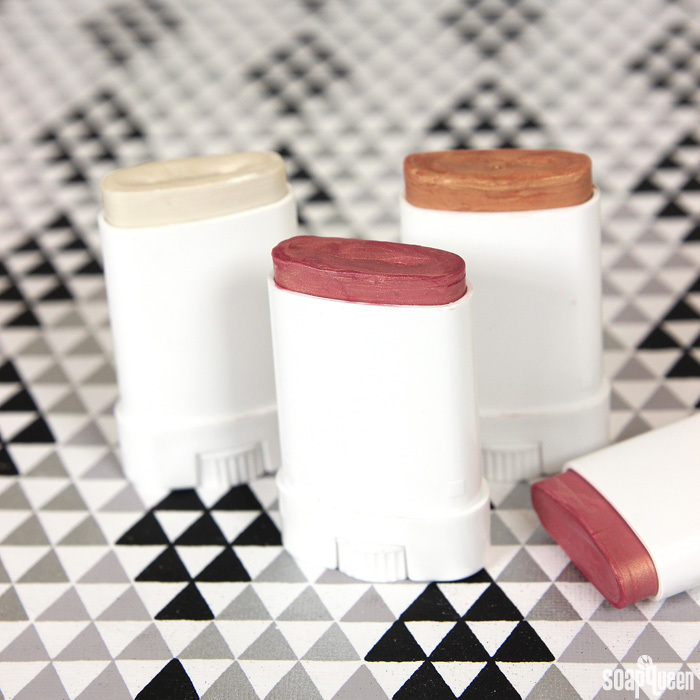 When adding micas and colorants to lip products, the frozen spoon trick is a great way to check the color before the entire batch of balm hardens. In the Creamy Marsala Lip Tint tutorial, Merlot Mica gives the balm a wine color inspired by the Pantone color of the year, Marsala. If you’re looking to add color to your lids, check out the Mystic Mermaid Eye Shadow + Application Tutorial and the Glamorous Gold Eye Shadow Quad. 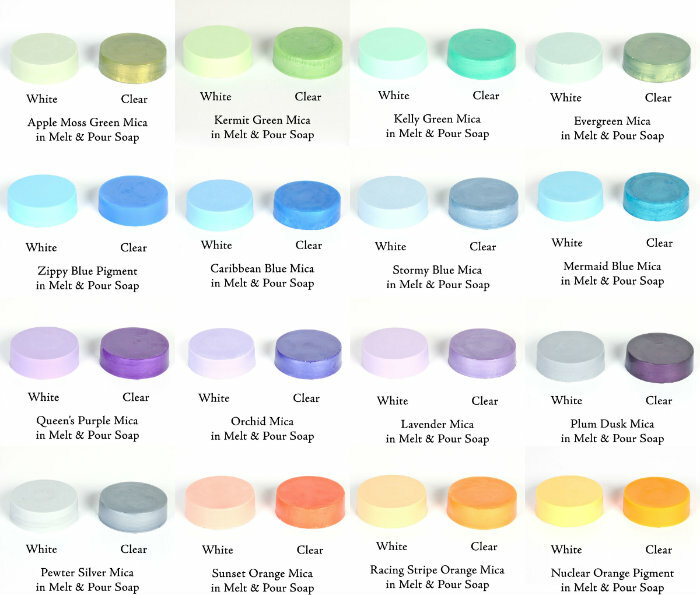 Speaking of micas, we have several new mica colorants that work great in melt and pour soap, lotion, and makeup. The King’s Gold Mica is a wonderfully warm, and rich gold color. The new Snowflake Sparkle Mica is a large particle mica that is incredibly sparkly. Looking for a new shade of pink? The Party Pink Mica and Rose Gold Mica are wonderful options. For a darker, richer hue, the new Desert Red Mica looks fantastic in soap and other projects. What is your favorite way to use mica colorants in your projects? Do you have a favorite color?